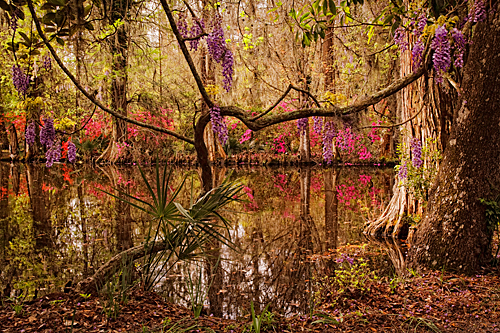 Every spring I look forward to teaching a workshop and capturing images in Charleston. With each visit I find something new something that I had not seen before. Sometimes it is one flower or part of a Wisteria vine that may not have been there before or had not been in bloom when I had past it by. Often it is the light and the way it interacts with the environment that makes the difference. I had past by this Wisteria vine dozens of time over the 20 years that I have visited Charleston and last year was the first time that I caught it in bloom. I revisited this location 5 or 6 times over a period of three days taking images and this one exposure captured it better than any of my other attempts. It was early enough that the soft morning light before sunrise lit up the background without washing it out and there was no wind moving the delicate petals during the half second exposure. I set my f-stop was set at F/4 to bring the wisteria cluster into focus and leave the background a soft blur. After opening this image in Photoshop CS6 I used Film Effects in Color Efex Pro to give it the look of an image captured on film. I arrived home on Saturday from the Charleston Workshop in time to enjoy the holiday weekend with family and friends. The weather and shooting conditions were great in Charleston and everyone captured some great images. Over the course of the workshop I could see the students grasp a better understanding of how their cameras function, which will allow them to capture better images in the field. More important than camera functions is the understanding of Composition and use of natural Light to capture an image. By the end of the workshop I was glad to see every one had a better understand of composition and how to use natural light to capture their images. When we were not shooting or taking time to exploring Old Charleston we were able to go over some of the basics photographic software used in processing images. There are many great programs to choose from to process your images. My preference has always been to open my RAW images in Camera Raw in the Photoshop CS5 or Elements 10 programs for a few basic adjustments. After the basic adjustments I use Nik software to fine tune my images. I am in Charleston getting ready to give a workshop and the last three days have been a nice combination of scouting and capturing some wonderful images. There has been a nice mix of sun and clouds that has extended my shooting time. While processing images and havening lunch at Panera Bread the battery went on my mouse. I went digging in my backpack knowing I didn’t have any batteries with me but I found 4 AA batteries a client from theVeniceworkshop had given me to replace the ones he had borrowed. When he gave me those 4AA’s I though that I would never need them because I had 100 of them and the drawer at home. Well I am not at home and appreciate that I had them to finish working on the images. Sometime it is the little things that people do that makes our lives easier. Charleston is a city rich in history, tradition, Southern charm and beauty. The Battery Park area is one of the oldest communities in the U.S. and offers a wide range of photographic opportunities. 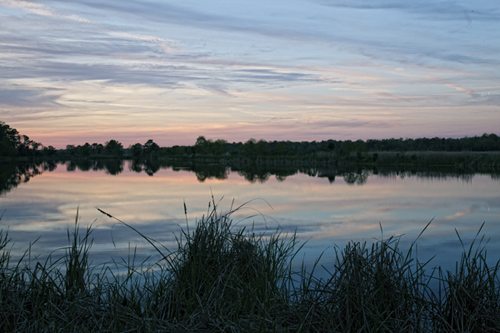 We will be spending time photographing gardens, reflection ponds and cypress swamps. Angle Oak a 1500 year old Live Oak is the oldest living tree east of the Rockies and is one of the locations we will be visiting during the workshop. Our field time will be spent on composition and proper use of light. We will spend sometime processing images using Photoshop and Nik Software to help you with your processing skills. A training video is included that you will be able reference when you are processing images at home. Our goal is to teach you how to capture beautiful images and explore how to create the images that continue to inspire. Day One: 5 pm get together in Charleston to go over equipment and if time allows Photograph at sunset. Day Two– Five: Photograph at sunrise in the Old Charleston and when the light is right. Day six: Photograph Sunrise and go over final thoughts before saying goodbye. The Spring Charleston photographic workshop has ended after our morning shoot on the 9th of April. We started our last morning shoot photographing Rainbow Row, in the historic Battery Park section of Charleston. As the light shifted we zigzagged our way through the narrow streets capturing a few last images before the morning light was gone. After the soft morning light had gone we walked down to White Point Gardens and enjoyed the walk up Meeting St. enjoying each others company and taking a few last images along the way. When we arrived at Meeting St. and Broad St. we found a breakfast spot to have coffee, tea and a chocolate muffin while we spent a little time going over the locations we had enjoyed together before saying our goodbye’s. We enjoyed good weather and shooting conditions through most of the trip and we were able to capture some extraordinary images. After everyone experienced photographing on a cloudy morning where we have extended shooting time before the morning sun oversaturated the colors they started to understand the concept of soft light.